I’ve posted some recipes before, and said that sometimes it’s easiest to thinly slice meat when the meat is half frozen. I do this for pork tenderloin or chicken breast. I freeze the meat, and when it’s about half defrosted, that’s when I slice it. Well, I had no idea that this freezing/defrosting was really all necessary because MY KNIFE SUCKED! I was at Market Meats the other day buying a skirt steak. While I was standing there waiting for Spencer to pack it up, I noticed an ice cream bucket of knives behind the counter. I casually asked what those knives were for, and he told me they were knives used by the shop and were for sale. Apparently butcher shops get rid of their knives very quickly, because only the sharpest knives will do the trick for them. So once the knives aren’t razor sharp anymore, the shops would rather buy new knives than hang onto these. So Market Meats sell these pricy Greban professional knives at $10 a piece to consumers. I figured, for $10, I was willing to try one of these used knives. Spencer also assured me that if the knife ever becomes dull, bring it back to the shop, and he’ll sharpen it for me. He also threw in a de-boning knife for me for free. I was sold. Did I ever tell you I am a sucker for a deal? The meat knife had a plastic handle, and doesn’t seem very impressive or shiny. A few days later, I had to slice some fresh pork tenderloin that was NOT half frozen, and the knife sliced the meat like…like a HOT knife through butter! I mean, it was effortless, and just cut the meat like it was nobody’s business. That was a long winded post to say, hey, if you are in need of a good meat knife, why not ask your butcher if he has used ones to sell you? Or, hit up Market Meats on W. 4th. 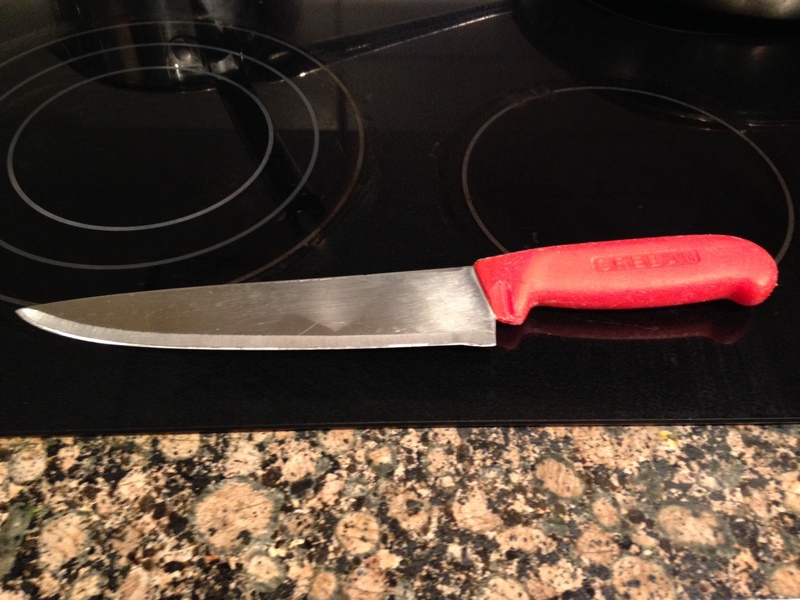 This entry was posted in Cooking and tagged butcher, knife, meat, sharp knife by angelasaito. Bookmark the permalink. Thanks for the great tip! We’ll have to check it out!